Lasko is renowned for its exemplary products. The quality and durability of its appliances used both in homes and offices is incomparable. 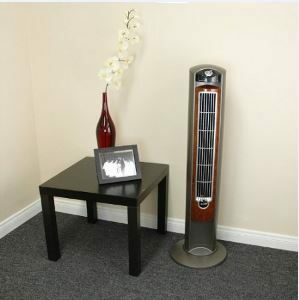 When shopping for a fan, you will likely come across most of these products on the shelf; the manufacturer has been in the industry for decades hence a popular brand. 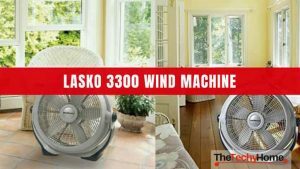 Lasko 2554 is one of the top models by the manufacturer; among the tower fans in the market, 2554 rates highly within Lasko products and among other tower fans by different manufacturers. Lasko 2554 is slim and unique design. You will fall in love with the fan even before reading its specifications. The dark brown color and shiny surface on the front makes it attractive. The slim design makes it suitable for any living room setting; it does not take much space. Also, it has a stable base that makes it independent; you do not need a stool or specific surface for this fan. Besides, its flexibility and portability makes it admirable and preferred by most people among other tower fans. The controls are well labeled with vents on the side that increases the fan’s efficiency. Lasko 2554 is barely noticeable; you won’t be bothered in the middle of the night by rotation of its blades. The design, flexibility, portability, and price are all favorable. 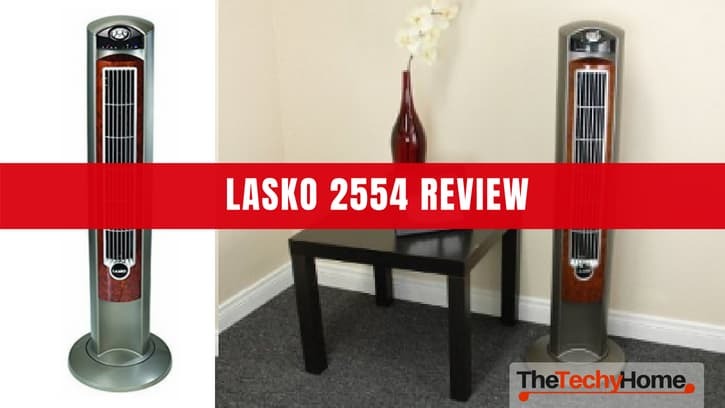 If you are looking for beauty then Lasko 2554 won’t disappoint you. The dark colors makes it elegant. When it is standing at the corner of a living room, you will barely recognize it as a fan. In fact, it doubles as a house interior décor. 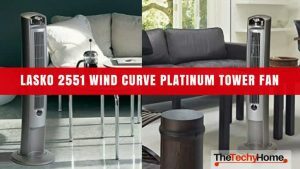 The slim design portray it as classic; the fan has a modern look. There are no excess material used in construction; this does not mean the fan is of low quality. 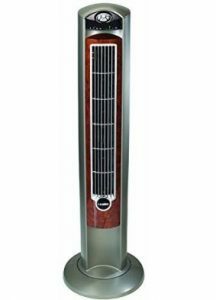 The manufacturer has only focused on necessary and quality materials in designing this fan. It is not bulky or heavy. Lasko 2554 has extra vents, which increase its speed and efficiency in blowing air around the room. The spacious and extra vent space reduces noise when you switch it on. 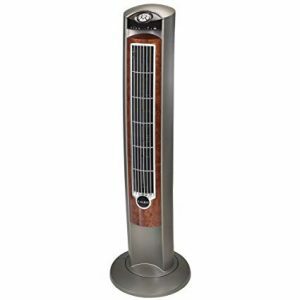 Lasko 2554 has5 buttons on the front for easy adjustment and control of the fan’s function. The five buttons are for power, timer, speed, ionizer and OSC. Lasko 2554 is easy to carry around. The handle at the top gives ensures you have a firm grip and control of the appliance when shifting its position. The handle is also firmly fitted on the body of this fan, which assures you the fan’s safety. The weight of the fan is balanced with toughness of the handle hence no worry of dropping it as you shift from the living room to the bedroom. In addition, Lasko 2554 has a relatively long power cable, which increases flexibility of its position. You are not restricted to a power source because the DC cable is extended. If you need it next to your bed the whole night, the power source is no problem. 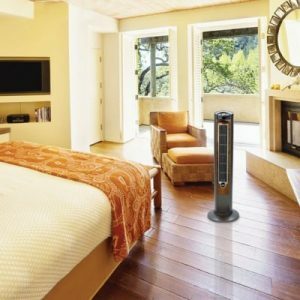 You will love this fan because of its timer efficiency and effectiveness. The time can be set from 30 minutes to 4 hours. You don’t have to interrupt your sleep to stretch out because you forgot to switch it off. If you can’t sleep with the high temperatures in your room, switch on this fan and set a 3 to 4 hour timer. 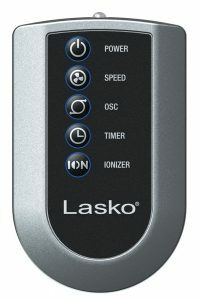 Unlike other timer on fans, Lasko 2554’s timer function is effective; it will not fail even once. Besides the primary timer settings, 2554 allows you to extend to 7.5 hours. 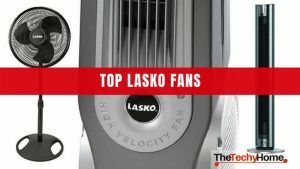 The dual timer setting is a unique and distinguishing feature of this fan from Lasko. Apart from the timer, the manufacturer offers a remote control. Evidently, using Lasko 2554 is hassle free. You do not have to move from your couch to switch it on/off; a remote control adjusts the speed and oscillations instantly. You only require 2 AAA batteries to use the remote. The timer can work best at night or when you need to leave the house but you want the fan to keep running. A remote is effective if you are in a large room where movement is a hassle. The fan’s performance is no doubt. However, the oscillation is relatively low. If you need rigorous and quick airflow in a large room, Lasko 2554 might be disappointing. It does not sweep across the room as you would expect with a tower fan. Nevertheless, its performance is enough for a small room or office. There are no extreme when using the fan. When you receive your order, you will have to learn how to fix the two parts. The fan comes in halves. But it is not anything to worry about because it is a simple fix; no special equipment or skill required. Besides, the manufacturer provides a manual in the package to help you clip every component to its rightful place. Blades, which require special skill and carefulness will be already fixed. After consistent use of the fan, you need to dismantle its parts and clean the blades and vent. In blowing air, fans interfere with particles in air hence some sticking to the blades and vent. Cleaning is a maintenance practice that assures you durability of the fan.